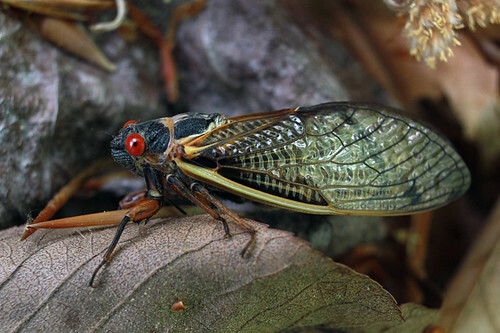 13-year cicada – brood XIX, originally uploaded by myriorama. The first photo I’ve seen of Brood XIX Magicicada so far in 2011. Appears to be a Magicicada tredecim. You can see this insect on Bug Guide as well. Update (4/19): here’s the second photographed adult. This one is from Virgina I believe. Right now adults should be showing up here and there, but it won’t be for a few more weeks before things get crazy. Update (4/26): there’s lots of Brood XIX photos showing up on Flickr now. I started a Brood XIX Gallery in an effort to keep track of them. I live near a river in North east georgia.We are covered up in cicadas.The bradford pear in our front yard is so full you cant even walk around it the noise is horrible.Nature is a wonder too behold but ive had enough. Traveling along I-77 south of Rock Hill, SC, yesterday I had my windows up and my radio blaring, but the noise from the cicadas outside was so loud that it overcame all that AND the road noise, and the bugs were a hundred feet off the highway in the trees! I saw one ciciada chilling on the porch in front of my door this morning. I also saw one of the outter shells that one must have emerged from, could have been the same one. I thought they only came out in the evenings but I’ve been hereing them cat calling since noon. Sounds like hundreds of them. I’m here in Huntsville, AL. Amazing! We’ve been hearing a loud sound in the woods behind our house in Rock Hill, SC since Friday. April 29th. It indeed sounds like an alien spacecraft. I’ve been tempted to go down and see what the source of the noise is but now I know. Thanks for the info. We have been finding the cicadas around the yard and lots of those holes in the yard. Just one question… are they harmful to crops/flowers? We’ve just planted our garden. Prairie Creek Campground (Lowndes County, Alabama) is full of cicade (the black ones). We just got back from camping there for the weekend and you could not even hear the birds singing for those things. You could hear them in the camper with the door & windows closed. I took a picture of one and of the skins hanging from the tree leaves. There are hundreds of some cicade brood in my yard molting May 7 in Mebane NC – the Piedmont area of NC. Are they Brood XIX?? I live in Rome,Ga. We got hit by a tornado on April 27, 2011. The following Sunday May 1,2011 while cleaning out our truck we noticed weird bugs on our daughters activity center. I was curious so I counted them. Just on the activity center was 104 and the tree next to had 35 of these bugs. I did not count the other trees nor all the bugs on our truck tires and on the ground. We thought they were locust! I had no idea they only came out every 17 years. This is amazing! There has go to be hundreds of them in my yard because I can hear them inside the house. I live in VA, and I found 2 dozen of these (at least) on my porch and trees this morning. My kids were freaking out. I have never seen them with redish orange eyes. We always saw the green ones where I grew up(in Texas). They always stayed green. I loved playing with them, however these black ones even creep me out. Magicicada on my finger by Dan from Cicada Mania on Vimeo. They are out in full force in Lincolnton, GA. Noisy little creatures and they are everywhere! Sorry, did not realize I could not post a link in the body of the message. The link immediately above points to the image of a presumed M. tredecassini that I saw in Durham, NC on 30 April 2011. Lots of periodical cicadas hatched last night in our backyard (Orange County, NC). Most had successfully emerged in the dark, but the ants are having a feast on the latecomers. I have lived in Rock HIll SC for 17 years and thought this must be the 17 year brood as I don’t recall having seen any in 1998. I am facinated by them and have been out two evenings in a row to watch them emerge. Have yet to see one crawling out of the ground! My husband’s truck has about 100 on his wheels and I have them hanging on my washing line and all over our oaks. We began noticing them last Saturday after the early morning storm. With each passing day, more and more have emerged and they seem to like our carport. This morning our azalea bushes are literally covered in them and I noticed sizeable holes in the ground near those bushes. We’ve lived on this property for 26 years and while we’ve observed cicadas before, we’ve never seen this many. Been watching their liftoffs all morning. My mother and I found 30-40 this morning on our back deck, back of house, my sons playhouse and my sons sandbox. I have never seen so many at once. We also had a report with a photo from Saluda County in SC on April 9 and a report from Greenwood County in SC with photographs, yesterday, April 18.